"The bechamel adds a little something special to this wonderful lasagna. I like to use part skim ricotta and mozzarella and low-fat milk to cut some of the fat in this dish. You won't notice the difference." Place the sausage in a skillet over medium heat and cook until browned and crumbly, about 10 minutes. Drain the sausage and set aside. To make bechamel sauce, melt the butter in a saucepan over medium heat and whisk in the flour. Allow the flour and butter to cook until light and foamy, about 2 minutes, whisking constantly; whisk in milk, a little at a time. Whisk in the salt and nutmeg and bring the sauce to a bare simmer, whisking constantly until thickened, about 10 minutes. Remove sauce from the heat and set aside. In a bowl, beat the egg and stir in the ricotta cheese and parsley until thoroughly combined. 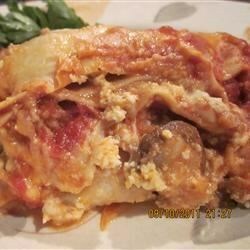 To assemble lasagna, pour about 1 1/2 cup of marinara sauce into the bottom of the prepared baking dish and top the sauce with 4 lasagna noodles, overlapping if necessary. On the noodles, layer 1/3 of the ricotta mixture, followed by 1/3 of the cooked sausage, 1/3 cup of mushrooms, 1/4 of the bechamel sauce, 1 cup of the mozzarella cheese, 1/8 cup of the Parmesan cheese and 1 more cup of marinara sauce. Repeat the layers twice more, ending with a final layer of noodles topped with a layer of marinara sauce, bechamel sauce, the remaining mozzarella cheese, and remaining Parmesan cheese. Cover the dish with foil. Bake in the preheated oven until bubbly and the noodles are tender, about 1 hour. Remove foil and bake until the top cheese layer is browned, about 5 more minutes. Allow the lasagna to stand for 10 minutes before cutting. Very good, I doubled the sausage, added some hot pepper flakes and used a whole 8 oz bin of mushrooms but other that i followed the receipe. Definetly use a deep deep deep lasagna dish. This was fabulous! I loved the addition of the bechamel sauce. Next time, I would add a lot more Italian sausage.